The gift cards will be included with Apple’s flagship products, such as Macs, iPods, and iOS Devices, in addition to third-party accessories. The gift card amounts are said to fluctuate based on the product. For example, gift cards that accompany accessories will have lower amounts of money than Macs. it’s still plausible that discount pricing could be available for some products via Apple’s online store. 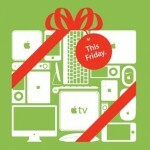 Apple is yet to confirm that this year’s deal will be gift-card centric, and, of course, plans could always change. It’s also uncertain if this gift card promotion is U.S.-only or worldwide. Our advice? If you're in the market for a new iDevice or a costly accessory, set an early alarm tomorrow morning and scan through your options. Most Apple Retail Stores are opening at 6 a.m. local time. 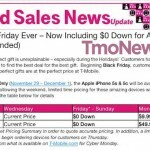 For an idea of last year's Apple Retail Store and Apple Online Store Black Friday discounts, take a look at our original article. See also: Peggle-Like Papa Pear Saga Bounces Into iOS As King's Next Potential Smash Hit, Apple's iPhones Make Up 76 Percent Of All New Smartphone Sales In Japan, and As Night Falls, Badland's Day II Chapter Comes To An Epic Conclusion ... With Lasers.